You might not associate Ghana with good swell, beautiful lonesome beaches and tropical rainforests. However that is what you get in this central African State, and much more! If you plan a trip to Escape 3 Points, you will not only find good waves for surfing, but many more options to enjoy this exciting area: kayaking trips to the mangroves, drum- or batik workshops, excursions to the surrounding towns (e.g. Prince Town), yoga, snorkeling, beachvolleyball, slacklining and many more. If you are lucky, you might even be able to do some whale watching. For getting to Cape Three Points, most of the guests fly to Ghana`s capital city Accra. Because of ecological reasons, once again, we recommend to take public transport (train, bus) for the continuing journey to the city of Takoradi (about 4hrs/200km South). However, there is an airport in Takoradi as well. From there to the Ecolodge you can take an (ideally) full taxi or rental car (1.5hrs) or check the typical “Tro-Tros” (Minibuses) to Agona Nkwanta and then Cape Three Points. The Escape 3 Points offers different kinds of accommodation types for different budgets, but all are made from mostly natural and/or recycled materials! There is a dormitory with bunk beds and shared bathroom (8€/night) as well as small, medium, large and family chalets with private bathrooms (up to 45€/night). All details about amenities and availability you will find on the Ecolodge’s website. 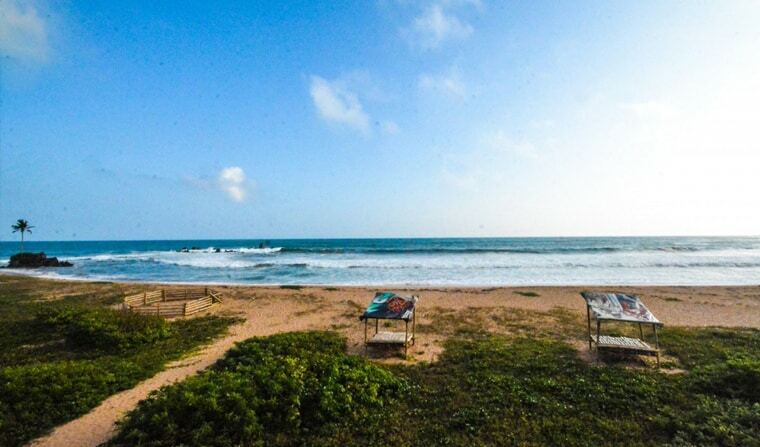 In this part of Ghana you will not only find beautiful beaches, but you will also have them mostly for yourself. This makes it not only ideal for surfing but also for relaxing, in case you have to wait a bit for the swell. By the way, the waves are best and most consistent in the rainy season (mainly April-September), when the swell from the South Atlantic Ocean arrives at Ghana`s coastal line. Unfortunately in this season you also have to deal with annoying onshore winds. But you can expect nice water temperature of around 25-27°C. In front of Escape there are a couple of beach breaks and one right- and one lefthander point break. Stormriders even rated the right as the 65th best point break of the world. And also in the surrounding coastline you will find some more good spots, like for example the Mutrakni Point. So just check out the known surf websites and forecasts (swell often below 2m) and decide which board you want to bring. However also the team of Escape 3 Points can give you some further information or also offer you basic surf lessons and a small range of surfboards for rent. The team behind Escape 3 Points follows a notable approach to combine ecological and social consciousness with surf tourism, so the local community of Cape Three Points can benefit from it and the environment is respected. Especially worth mentioning are their low-energy-houses, recycling- and upcycling projects, installations of renewable energy sources and alternative sanitary facilities. Fresh and yummy vegetables and fruits come from their ecological garden, where they of course only use natural fertilizers. 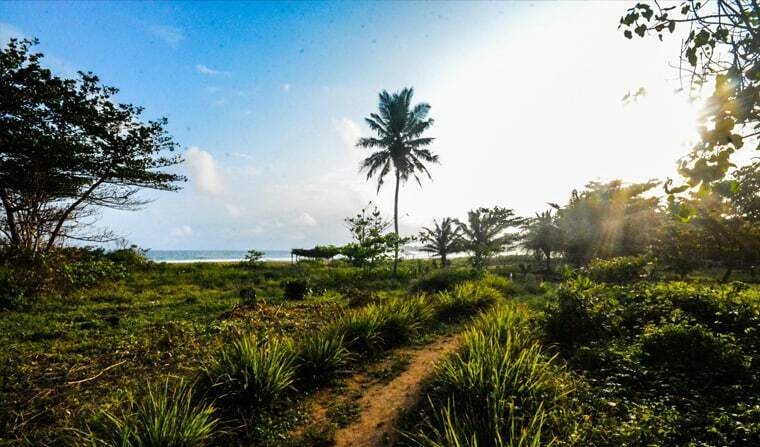 Other initiatives of the Eco-Lodge include the protection of the local flora and fauna – for example they have a project to preserve one of the last coastal forests in Ghana and they support the hatching of the endangered Leatherback turtle (biggest turtle of the world). Furthermore they work together with a local organization for environmental conservation. In most of those projects you can get active yourself – just ask the team for options as a volunteer and/or for internships. If you commit yourself for a month of voluntary service you will even get free accomodation & meals! If you are travelling to Ghana you not only need a valid visa, but also have to get the obligatory vaccination for yellow fever, which will be checked when entering the country. Other tropical illnesses like Malaria are unfortunately also widely spread, so we recommend to take some good mosquito repellent with you, as well as some malaria prophylaxis. Ghana is one of the most stable and safest countries in Africa, also for women, so we just want to encourage you to get to know this exciting country! If we could make you curious about this exotic surf destination, you can check out further information on the website of Escape 3 Points. 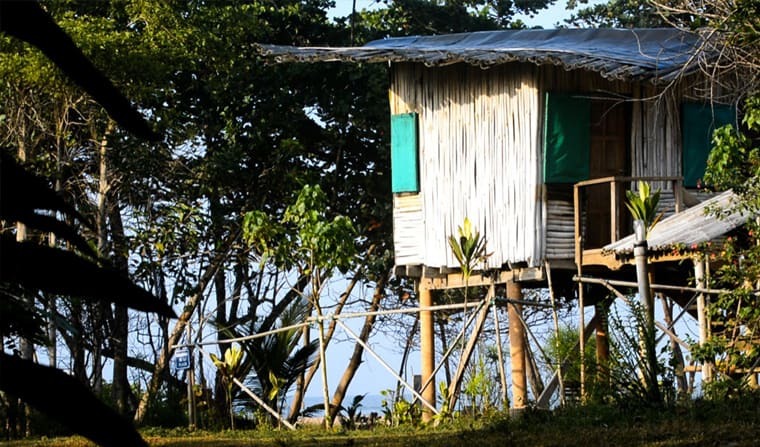 And if you have already some experience with this Eco Surf Lodge or something else you want to share with us, we will be happy if you tell us about it through a comment below.